The beaches of Barcelona are a big hit with holidaymakers, but that’s not to say that the mountains surrounding this bustling metropolis shouldn’t get a look-in with visitors too! At the highest point of the beautiful Collserola range, you will find Mount Tibidabo. One of the most popular attractions in Barcelona, here you can enjoy the rides at the oldest amusement park in Spain, indulge in some fine dining under the stars and take a walk up to the highest point for some spectacular views of the city. There’s even the option to rent one of the many apartments in Barcelona situated in the foothills of the mountain, for amazing views every day! 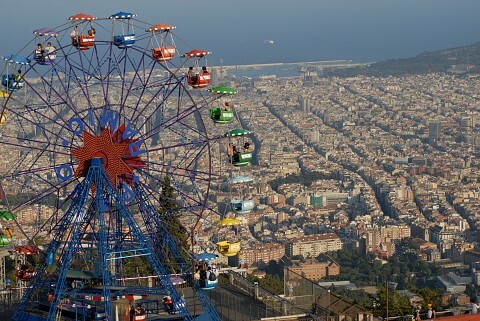 Below you’ll find just a few of the best places to go to get the most out of your Tibidabo adventure in Barcelona. 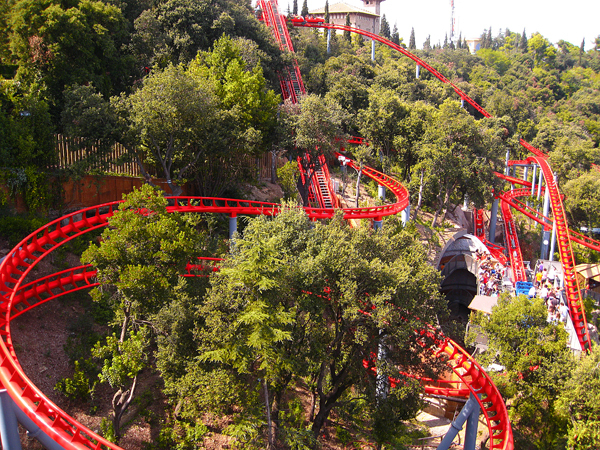 The Tibidabo Amusement Park has been a staple of the Catalan capital since the turn of the 20th century, and should not be missed on your trip to Gaudí’s city! As one of the oldest adventure parks in the world, the rides here will whisk you away from the hustle and bustle of Las Ramblas for a fun-filled day out! We suggest you make your way to the Sky Walk area, hop aboard the little red plane and lose yourself in the awe of the extraordinary views of Barcelona. No trip to an adventure park would be complete without candy-floss, so be sure to grab some as you enjoy a ride on the traditional Tibidabo Ferris Wheel. For those movie-buffs out there, don’t forget to spend some time at the spot where part of Woody Allen’s hit film ‘Vicky Cristina Barcelona’ was shot! For more information on pricing, tickets and opening times, visit the Tibidabo Amusement Park official website. By train: Take L7 (Brown Line) from Plaça Catalunya to Avinguda Tibidabo. Please take note; this is a Renfe (FGC) operated train, so follow the signs. From there, you can opt for the historic Tramvia Blau, riding all the way to the last stop, Plaça del Doctor Andreu. At this point, you are halfway up the mountain, and to get to the amusement park, you have to take the Funicular railway. An unmissable sight from any part of the city on a clear night, the Tibidabo church, situated at the very top of the mountain over 500m above sea level, is home to the Temple Expiatori del Sagrat Cor (Church of the Sacred Heart). This church took over 60 years to construct and is considered to be one of the most important neo-gothic structures in Barcelona. You can reach this architectural wonder by taking the Tramvia Blau and the Funicular railway to the summit of Tibidabo, which is a historical journey in itself, as both the tram and train were built in 1901! For those who seek a day away from the busy Barcelona streets in search of an afternoon spent admiring the beauty of nature, a Tibidabo hiking trip may be just what you are looking for! Offering a green escape, the Collserola Mountain range is ideal. 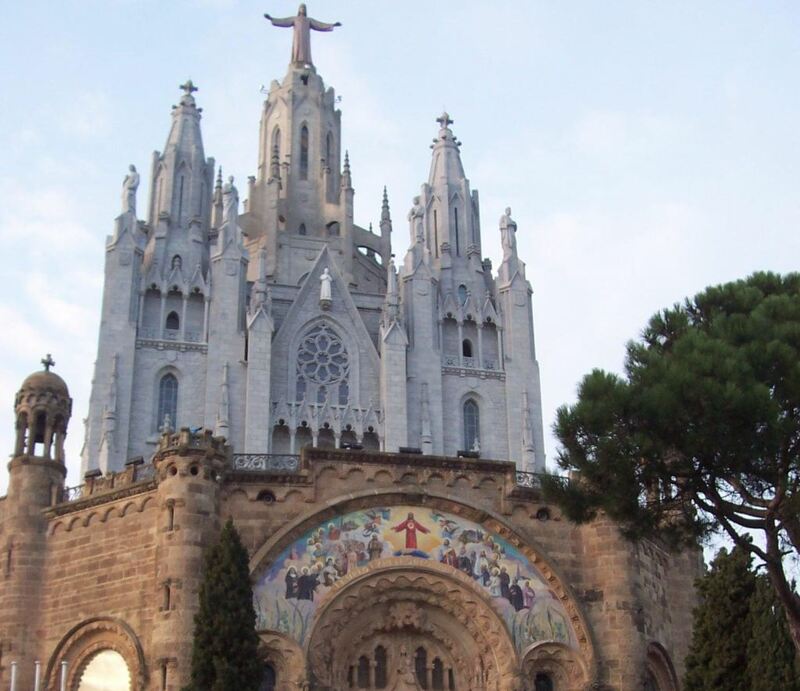 With plenty of walking and hiking tours available, this is sure to round out your Tibidabo experience. Try out the 4.2km trail from the Museu de la Ciència to the peak of Tibidabo, offering amazing views along the way! For those who are visiting Barcelona with kids, be sure to head to the CosmoCaixa Museu de la Ciència (Science Museum) near Tibidabo for some great interactive exhibitions. With interesting activities, as well as a Planetarium, this museum is ideal for youngsters who prefer a hands-on experience. The museum is situated on the foothills of the mountain, just before Avinguda del Tibidabo. Be sure to check out the Barcelona Turisme website for more information and a list of exhibits. How to get there: By train: Take the L7 (FGC) from Plaça Catalunya to Avinguda Tibidabo, and then switch to the 196 Bus. After a day of gallivanting across this mysteriously magical mountain, you may find yourself hungry. Rest assured, the various restaurants on Tibidabo are sure to satisfy every palate. Our recommendation is El Mirador de la Venta, which pairs great food with spectacular views…you can’t go wrong! 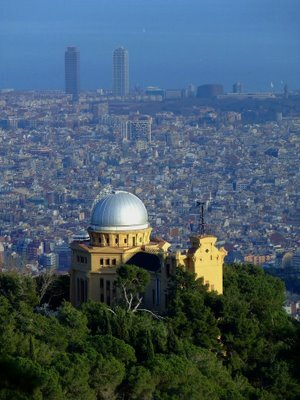 Couples visiting Barcelona should make their way to the Fabra Observatory for a sweet dinner on a secluded terrace, a tour of the golden-domed building and the chance to star-gaze through one of Europe’s oldest telescopes! Plus, you can always reserve one of the many Barcelona apartments close to Tibidabo, and enjoy your very own romantic views of the city every night! Want to spend a night amongst Barcelona’s elite while casually sipping on a cool cocktail? Then be sure to head to Plaça del Doctor Andreu, where you will find the exclusive Mirablau and Mirabé bar/nightclubs. How to get to the Fabra Observatory: By train: From Plaça Catalunya, take the FGC Line S1 or S2 to Peu de la Funicular. Switch to the Funicular railway from Vallvidrera Inferior to Vallvidrera Superior, and then catch the 111 Bus. This entry was posted in Activities, Places and tagged amusement parks barcelona, barcelona attractions, barcelona day trips, barcelona places, barcelona tourist guide, hiking trips barcelona, sightseeing in barcelona, tibidabo adventure park barcelona, tourism in barcelona, travelling around barcelona, visiting barcelona, visiting barcelona with kids. Bookmark the permalink.